This page is by Nicholas J. Matzke. My ORCid is: http://orcid.org/0000-0002-8698-7656. Q1. What does this paper show? Q2. Wait, there's still antievolution legislation being proposed in the U.S.? Q3. What's a phylogenetic tree? Q4. What's different about the phylogeny in this paper? Q5. How do I read a phylogeny? Q6. What's the big deal about "direct ancestors?" Don't all studies of evolution and fossils deal with ancestors? Q7. Does inference of direct ancestors mean that we will start to see scientific papers claiming that fossil species X is a direct ancestor of living species Y? Q9. Okay, we have the phylogenetic history of creationist bills. What does that tell us? Q10. It's ironic to say "creationism evolves," but creationism hasn't been in the news in the United States for a while, and in other countries this issue seems very strange. What's the big picture? Q11. Why do these bills matter? Q12. In addition to the author, who else can I contact to discuss the science and/or the science education issues raised in this article? Below are author archives of the paper and Supplemental Materials, as per Science policy. Citations must cite the published reference and DOI, above. Note that the version of the Supplemental Material posted by Science originally had a corrupted Figure S10 that only partially displayed. The editor says this will be fixed, in the meantime, below is the final submitted Supplemental Material PDF. I am also including graphics and data files that may be useful for educational, research, or media purposes. I am releasing these under the Creative Commons Attribution-ShareAlike 4.0 International License (CC BY-SA 4.0). Zipfile of Supplemental Data - I release all of the files I authored under CC BY-SA 4.0; a few files are modified from analysis scripts written by others (e.g., standard TNT macros), and these retain whatever original licenses they had. 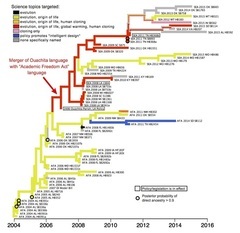 Tracing the evolution of antievolution legislation. Maximum clade credibility tree from Bayesian tip-dating analysis of 67 policies. The SEAs originated by combining text from the AFAs with Ouachita Parish, Louisiana, policy text from 2006. Seven bills have a high posterior probability of being direct ancestors of the rest of the tradition (circles). The tips of branches reflect the bills' publication dates [except for the DI model bill (see text)]. The nodes (splitting events) represent copying events. The distance between a tip and a node is an inference about how much change occurred and how much time this took. When the node-to-tip distance is effectively zero, this indicates a high probability of direct ancestry. Tip labels indicate AFA or SEA, year, state, bill number (SB, senate bill; HB, house bill), and versions (a, b, or c, for legislative revisions; t or f, teachers or faculty targeted). Branch colors indicate the sciences targeted; mixed colors on a branch indicate uncertainty in the reconstruction. See SM for full details of analyses. This is the original graphic (derived from Mesquite output) that served as the basis for Figures 1 and S10. This version I release under CC BY-SA 4.0. Various file formats: JPG, PNG, PDF. A medium-resolution JPG of the main figure, as published in Science, is this file (JPG). It was used in various media sources, presumably given out on by Science's internal press website, I don't know the exact conditions on its re-use, see Science's permissions policy. As far as I have any say, I am happy for it to be re-used for media purposes or nonprofit research/educational purposes, no need to ask me. This table, Supplementary Table S1, gives a summary of antievolution strategies back to the 1920s. This is given for historical context, to show how little in the present wave of "academic freedom" / "critical analysis" bills is really new. Note that, prior to 2005, this contains only a summary of the most prominent antievolution policies and bills of the 20th century. If they were all listed, there would be hundreds of entries, perhaps a thousand or more if local policies and proposals were included as well as state-level proposals. Below is the text of an FAQ I developed to answer press questions, but it may be more generally useful. Free to quote/reprint for educational purposes. (I.e., text and figures are CC BY-SA 4.0). 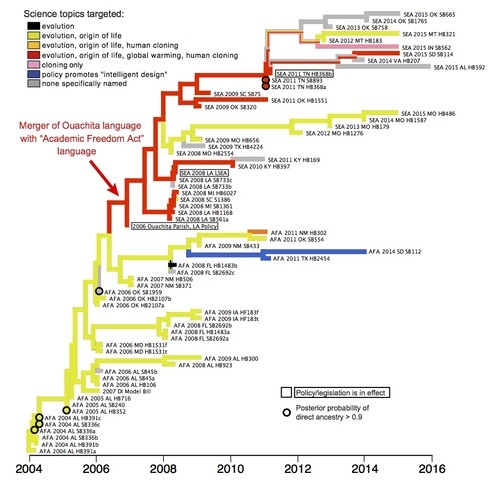 This paper reconstructs the "phylogenetic tree," or "phylogeny," of the evolution of antievolution legislation in the U.S. from 2004 to the present. Like a family tree, it shows the relationships of proposed antievolution bills. In some cases, statistical methods were used to infer which bills were the parents (sources) of later bills. Yes, and sometimes it's successful, as in Louisiana in 2008 and Tennessee in 2012. 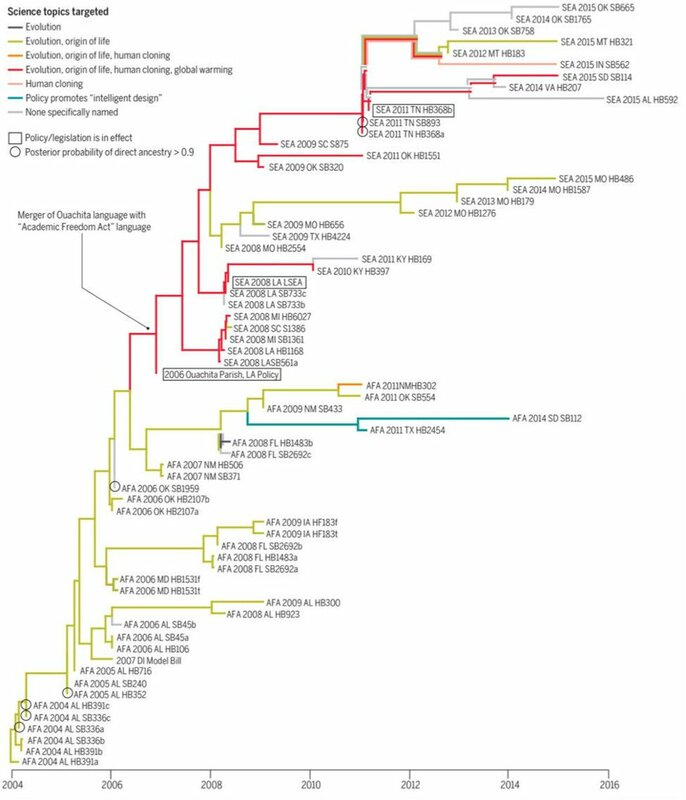 This study built a phylogenetic tree of passed and proposed antievolution bills. The tree shows a version of the Tennessee bill was copied to many other states. The Tennessee law was copied from text originating in Louisiana in 2008, and the Louisiana bill and many others are modified copies from bills proposed in Alabama in 2004-2005, combined with text passed in Ouachita Parish, Louisiana, in 2006. 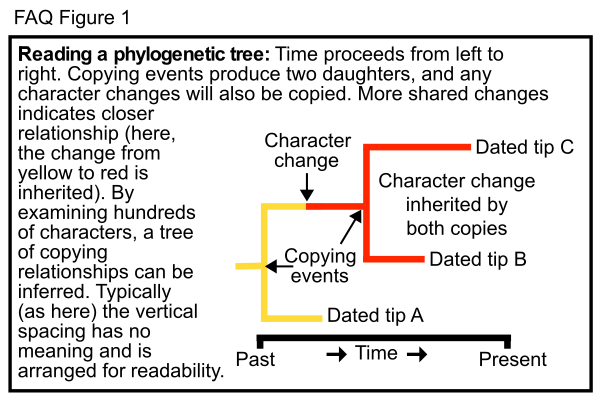 A phylogenetic tree, or phylogeny, is a graphical representation of copying relationships. Phylogenies are typically used in evolutionary biology: In any species, the DNA sequences of one generation are copied to the next generation (just as your parents' DNA was copied to your DNA). A population or species through time is called a "lineage." DNA copying is not exact (because mutations occur every generation), so lineages will gradually change as mutations accumulate. This is evolution: "descent with modification," as Darwin put it. When a lineage splits — one population becomes two — then the new populations can evolve independently. In biology, this is called "speciation." In a phylogenetic tree, speciation is represented by the splitting branches. Not all phylogenies are based on DNA. Some studies use fossils and "coded characters" that describe the shape and characteristics of the fossils. For example, absence or presence of a tail might be coded as 0 or 1. In this paper, instead of tracking the copying and modification of DNA and the splitting of DNA lineages, what is being tracked is the copying and modification of the text of legislative proposals. Splitting events on this phylogeny represent production of a new version of a bill. The "tips" of the tree represent the dates of the actual published versions in state legislatures. Interestingly, the same phylogenetics software (BEAST) can be used for both traditional DNA analyses and for this "phylomemetics" study. Probably! But keep in mind that the methods are new. In the case of bill texts, the entire history has gone on during human lifetimes (although some of it may have been hidden from public view), and we think that we have all of the bills that were published in legislative sessions. The case of fossils is much more complicated, because we usually don't think we have collected all of the fossil species that existed, and because there are many biases in where fossils get preserved and discovered. Still, in "ideal" situations, we may be able to detect direct ancestors with high confidence. The statement "high confidence" is key. Keep in mind that all of science is about estimation, not finding the exact perfect truth with 100% confidence. These phylogenetic methods are Bayesian, which means they assign probabilities to hypotheses. So the result they produce will be conditional probabilities, for example, "fossil X is the direct ancestor of fossil Y with 92% probability, given the data and the assumptions of the statistical model." How high of a probability is "good enough" is a question readers must decide for themselves. "Phylomemetics" is the application of phylogenetics to memes. The term "meme" was invented by Richard Dawkins in the 1970s (The Selfish Gene, 1976), and refers to a cultural object that gets copied and modified in the culture. When memes are relatively long and stable (as with legislative bill texts), there is enough information to use phylogenetic methods to reconstruct their history. The paper shows the origin of a now-common tactic in antievolutionist language: laws encouraging "critical analysis" of not just evolution and origin-of-life studies, but also of "human cloning" and "global warming." This linkage of all four topics was introduced in a 2006 school board policy adopted in Ouachita Parish, Louisiana ("Ouachita" is pronounced "Wa-shuh-tah"). This combination proved popular, and legislative bills using this tactic have since been proposed in many states, and were passed in Louisiana in 2008 and Tennessee in 2012. Figure 1 of the Science paper also shows which bills are estimated to be direct ancestors of the rest of the tradition with greater than 90% probability (circles). For example, it looks like the entire tradition after 2005 descends from a series of bills proposed in Alabama in 2004 and 2005. The creationist bills have a very strong "phylogenetic signal," meaning they have strong evidence of "descent with modification," compared to null models with no phylogenetic signal. This suggests that the evolution of these bills was dominated by copying and modifying bills one-by-one, rather than continual mixing (the merger of the "Academic Freedom" Acts and the Ouachita policy is the major exception). Estimating the date of the Discovery Institute Model Bill. 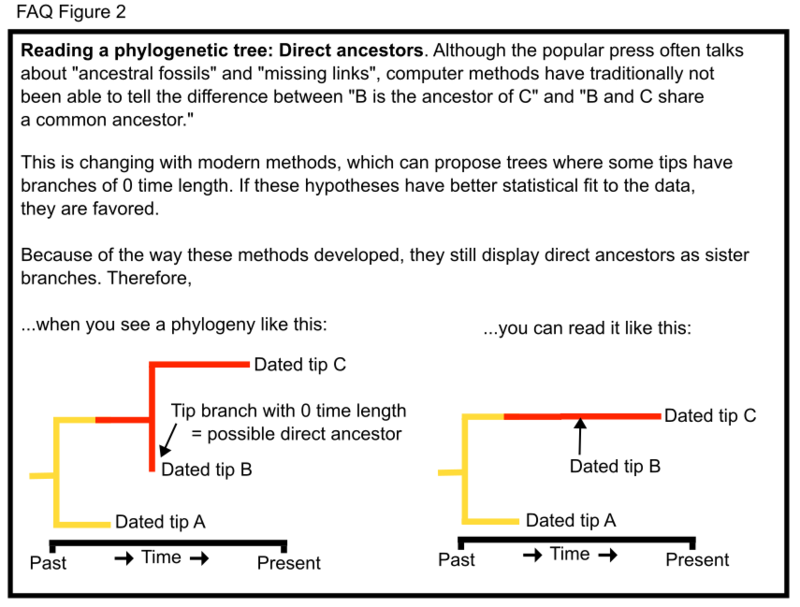 In addition to estimating a phylogeny from the data, the method can estimate the dates of texts, if their dates are considered unknown. This analysis put the date of the Discovery Institute's Model Bill as most likely in early 2006, rather than the published date of fall 2007. Diversification shifts: Certain parts of the tree show statistical "bursts" in diversification (the stars in Figure S11). These probably represent periods when many new bills were being proposed, copying and modifying from one or a few sources. Character histories. Just as Figure 1 shows which scientific topics are targeted by various policies, and how this trait evolved over time, the same analysis can be done for any other text segment of interest. These are available in Supplemental Data or PDFs. The United States has had several major waves of opposition to the teaching of evolution in biology classrooms in public (government-funded) schools. This opposition has always primarily come from conservative religious traditions that believe evolution contradicts a straightforward reading of the Bible. Of course, there are many religious traditions, and many ways of reading the Bible. When one group tries to get their religious view favoured by the government, the arguments (and sometimes lawsuits) begin, because the First Amendment to the U.S. Constitution states that the government "shall make no law respecting establishment of religion." Therefore, there have been several major court battles over the teaching of evolution and attempts to ban the teaching of evolution, balance the teaching of evolution with a supposed creationist alternative, or to belittle evolution as scientifically controversial. Over time, the creationists reacted to court defeats by adopting new strategies, with modern "stealth creationist" legislation being the latest. There is a very short summary in FAQ Table 1. For more, please see Table S1 in the Supplementary Material in the Science article, and the discussion and references in the text. 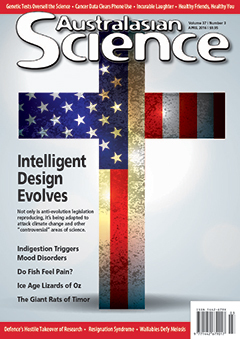 Notably, the Seattle-based Discovery Institute was a major promoter of "intelligent design," but especially after the defeat of intelligent design in Kitzmiller v. Dover almost exactly ten years ago (the case was decided December 20, 2005), the DI has promoted third-wave policies. If enacted, these bills would require or encourage teachers to misrepresent science — to present creationist arguments against evolution and climate change denier arguments against global warming — in the classroom. They also prevent administrators from doing anything about it. We already know that 1 in 8 high school biology teachers present creationism as scientifically credible; these bills would worsen the situation. Kopplin, Z. (2015). "Dismissing Darwin." Slate. April 21 2015. Below are phylogenetic "character maps" for all 418 characters and 15 traits I examined in this study. A character "map" is a proposed history of a character on a phylogeny. Many example character map graphics are on Google Images. Here, I did parsimony character mapping (a simple method that should work reasonably well on this dataset, see Supplemental Material; of course others are welcome to explore other methods). All of these character maps can be re-generated by loading up the relevant NEXUS files from the Supplemental Data in the free phylogenetics program Mesquite. There are brief instructions in the Supplemental Data. Please note, however, that the purpose of this Supplemental Data is to archive data and code for future researchers, it is not intended to be a teach-phylogenetics-from-scratch-to-beginners resource. Becoming competent with phylogenetic methods requires decent computer skills, and serious coursework (or, minimally, workshops; Bodega Bay and Woods Hole phylogenetics workshops are well-known ones; and there are many online tutorials for Mesquite and other programs). 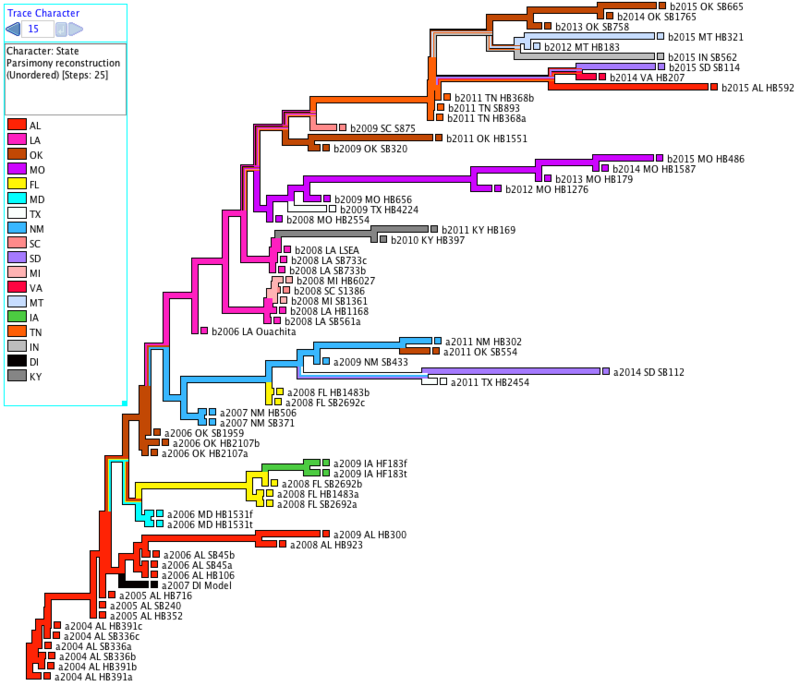 Note: Character maps represent an estimate of the history of a particular character on a particular phylogeny. They are not an assertion of the One True Absolutely Certain History, although they should usually be a good approximation. (Similar thinking applies to the phylogeny itself.) For an introduction to some of the issues, see Biogeographical Stochastic Mapping and the technical literature on character mapping and stochastic mapping. In addition, the program Mesquite (used to make these character map graphics) makes some graphing decisions that should not be taken literally, e.g. when it extends an ancestral state far below the ancestral node of any tips with data in the tree. This sort of thing is automatically discounted by researchers, but might confuse beginners. PDF of character maps for characters 1-111 on the Matzke (2015) phylogeny of antievolution bills. These are the "presence-absence" characters. PDF of character maps for characters 112-418 on the Matzke (2015) phylogeny of antievolution bills. These are the "variations when present" characters. 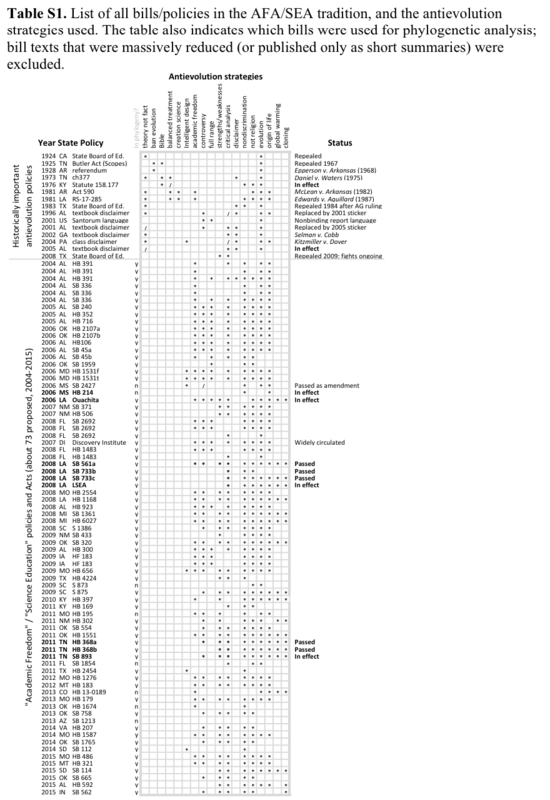 PDF of character maps for 15 traits of interest on the Matzke (2015) phylogeny of antievolution bills. Note: as described in Supplemental Material, here, by "characters" I refer to the data (418 discrete characters) used in the estimation of the phylogeny, and by "traits" I mean other features of interest (15 of them) that were either not used in the phylogeny (such as geographical state of origin), or that are extracted or modified from the character matrix to show interesting features, such as strategies. Trait map #14 is the basis for Figure 1, and combines several traits. There is a low-res video for the trait maps in the Phys.org news story: http://phys.org/news/2015-12-evolutionary-biologists-political-opposition-evolution.html ; the low-resolution is due to a size and format limits on the file I could provide to the media program at Science. All character and trait maps in one PDF. May be useful for making e.g. animations. Matzke, Nick (2016). "Creationism Evolves." Australasian Science, 37(3), 14-16, April 2016. Shapiro, Adam R. (2016). Creationism’s Future After No Child Left Behind. Religion & Politics. February 16, 2016. Winston, Kimberly (2016). Darwin Day notwithstanding, evolution debate keeps, well, evolving. Religion News Service. February 11, 2016. Kopplin, Zack (2015). Creationism Whistleblower: 'Academic Freedom' Is Sneak Attack on Evolution. The Daily Beast. December 28, 2015. Villatoro, Francisco R. (2015). La teoría de la evolución aplicada a la legislación antievolucionista. La Ciencia de la Mula Francis. December 28, 2015. Morin, Hervé (2015). Darwin, itinéraire d’un humaniste. Le Monde. December 22, 2015. Anonymous (2015). Die Verteidigung des Schöpfers. Der Standard. December 20th, 2015. Prothero, Don R. (2015). "MERRY KITZMAS! 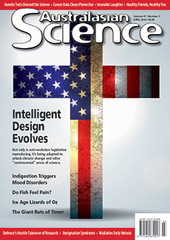 The 10th Anniversary of the Dover Decision and the Demise of Intelligent Design." Skeptic December 23, 2015. Gross, Rachel E. (2015). How Anti-Evolution Bills Have Evolved: Creationists provide an example of descent with modification. Slate. December 22, 2015. Jones, Sarah (2015). Growth Industry: New Study Illustrates How Creationist Tactics Keep Evolving. Wall of Separation, Americans United for Separation of Church and State. December 22, 2015. Doctorow, Cory (2015). The evolution of anti-evolution bills. BoingBoing. December 22, 2015. Kent, Bill (2015). How Creationism Has Transformed Since The Dover Trial. Echo Examiner. December 21, 2015. Jaffe, Eric (2015). The Evolution of Teaching Creationism in Public Schools. The Atlantic. December 20, 2015. Farrell, John (2015). 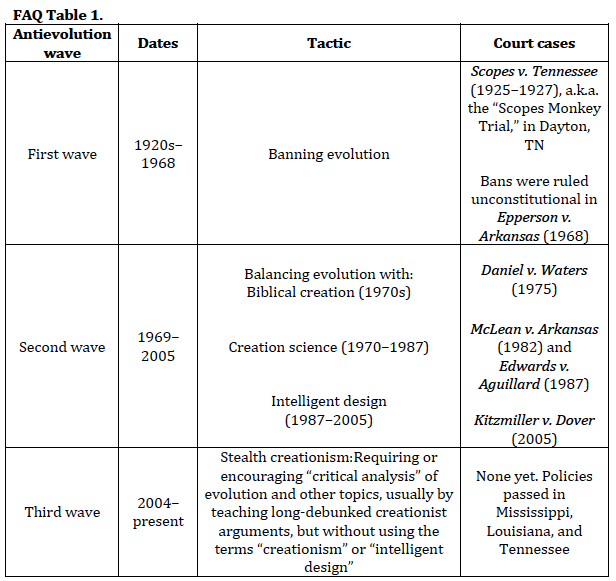 How Creationism Has Evolved Since The Dover Trial. Forbes. December 20, 2015. Mcghee, Rebecca (2015). "US Anti-Evolution Efforts Evolve In The Same Way Species Do." Capital Wired. December 19, 2015. Gorman, Nicole (2015). Father, Son Sue School Board for Not Teaching About Darwin. Education World. December 21, 2015. Anonymous (2015). Science used to trace how creationist anti-evolution tactics have evolved. Stuff.co.nz. December 19 2015. Parker, Jameson (2015). Scientist Studies Evolution of Anti-Evolution Bills, Finds They Aren’t Intelligently Designed. WinningDemocrats. December 18, 2015. Mirsky, Steve (2015). Anti-Evolution Legislation Shows Descent With Modification. Scientific American, "60-second science" Podcast. December 18, 2015. Aamir, Sumayah (2015). How Anti-Evolution Bills Evolve in US? I4U News. December 18, 2015. Hall, Natalia (2015). Pro-Creationism Laws in US Focuses on Making Classrooms Safe for Creationism. Northern Californian. December 18, 2015. Feltman, Rachel (2015). Science used to trace how creationst anti-evolution tactics have evolved. Brisbane Times. December 19, 2015. Feltman, Rachel (2015). Science used to trace how creationst anti-evolution tactics have evolved. Sydney Morning-Herald. December 19, 2015. Brown, Jennings (2015). Science Hero Made An Evolutionary Diagram Of Anti-Evolution Laws. Vocativ. December 19, 2015. Anonymous (2015). God versus nature debate continues between creationism and evolution. Web India, December 18, 2015. Anonymous (2015). How anti-evolution bills evolve. ScienceCodex. December 18, 2015. ANU (2015). How anti-evolution bills evolve. Science News. December 17, 2015. Al-Khatib, Talal (2015). How Anti-Evolution Policies Evolve. Discovery News. Resnick, Brian (2015). How creationist legislation has evolved, in one chart. Vox. December 17, 2015. Timmer, John (2015). Descent with modification applies to misguided bills, too. ArsTechnica. December 17, 2015. Feltman, Rachel (2015). How have anti-evolution tactics evolved over time? They've gotten sneakier. Washington Post. December 17, 2015. Anonymous (2015). Evolutionary biologists have analyzed political opposition to evolution and found it has evolved. Phys.org. December 17, 2015. Salas, Javier (2015). Darwin destapa las tretas legales de los enemigos de la evolucion. ANU (2015). How anti-evolution bills evolve. The Australian National University, via EurekAlert. December 17, 2015. Crawley, Catherine (2015). 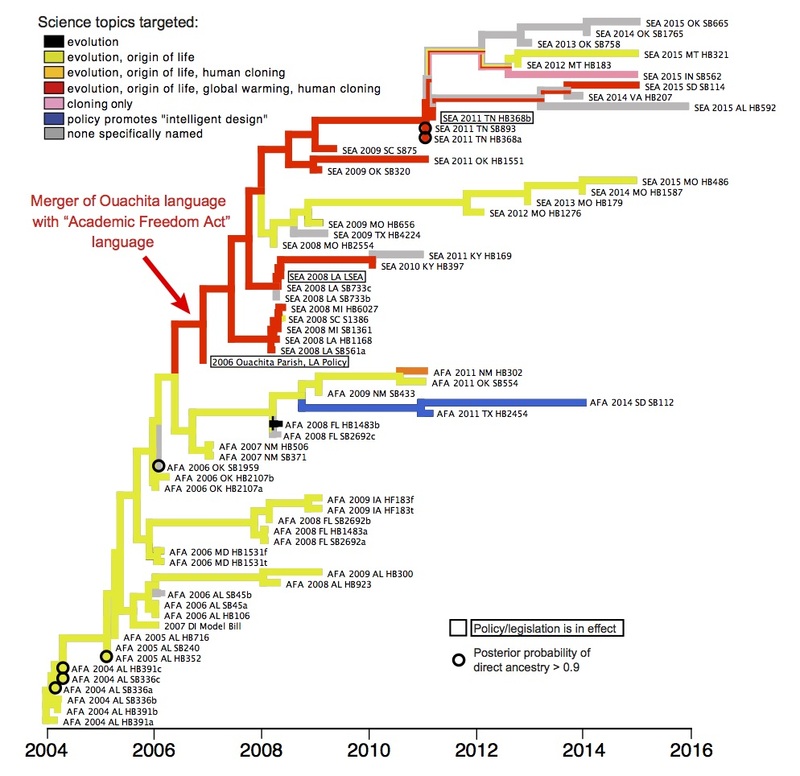 NIMBioS Study Shows Ancestral Relationships of Modern Creationist Legislation. Tennessee Today. Goldsmith, Greg (2016). The Phylomemetics of Creationism and Intelligent Design. A Few Thoughts blog, January 23, 2016. Branch, Glenn (2015). 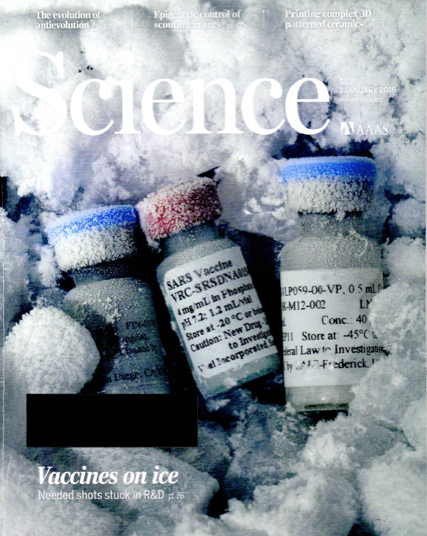 NCSE Evolution and Climate Education Update for 2015/12/25. December 25, 2015. Matzke, Nicholas (2015). Zack Kopplin interviews former Discovery Institute employee. Talk.Origins newsgroup, December 28, 2015. Anonymous (2015). Scientist Studies Evolution Of Anti-Evolution Bills, Finds They Aren’t Intelligently Designed. alt.politics.liberalism newsgroup. December 27, 2015. You should be less concerned about me, and more concerned about criminal misuse of public funds intended for scientific research to advance a political agenda. …Quite a bit of of drama for a paper that took a few weeks to do. Thomas, Dave (2015). "The evolution of antievolution policies after Kitzmiller v. Dover, New Mexico Version." December 20, 2015. Givnish, Tom (2015). Wisconsin Botany, public Facebook post. December 20, 2015. Braterman, Paul (2015). The evolution of creationism; Kitzmiller 10 years on. Primate's Progress. Carlson, Dave (2015). The Discovery Institute versus Nick Matzke. The Skeptical Zone. December 19, 2015. Though you are a coward, you are no fool - you know when to cut and run. Your receiving taxpayer's money in publishing this PROPAGANDA PIECE is unconscionable. You belong in prison, in my opinion. …so much for advocacy of "academic freedom." Elsberry, Wes (2015). After the Bar Closes Discussion Board. December 18, 2015. Matzke, Nicholas J. (2015). 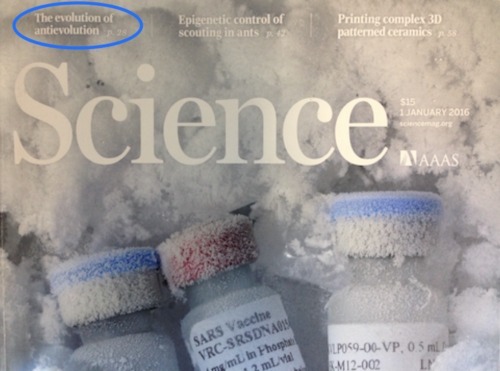 Bonus material on Matzke 2015 Science Paper On The Evolution Of Antievolution. December 19, 2015. Mehta, Hemant (2015). New Paper Shows How Creationist Legislation, Ironically, Evolves Over Time. December 19, 2015. Rosenau, Josh (2015). It's Kitzmas Time Again, Charlie Darwin. NCSE Science League of America blog. December 17, 2015. Myers, Paul Z. (2015). Taking a phylogenetic approach to the law. Pharyngula. December 18, 2015. PZ Myers makes some very worthwhile points regarding researcher freedom to explore new areas. I would add that everyone in science knows that much of the best creative science takes the form of "side projects." Senusous Curmudgeon (2015). John West Is Angry at Nick Matzke. December 18, 2015. Uncommon Descent Blog (2015). Do the Australians know what they’re getting, with Nick Matzke? December 18, 2015. This is an ID blog. For a sense of their attitude towards me, check out this comment from December 15. Hint: by "Down Under", he doesn't mean Australia. West, John (2015). Did Nick Matzke Misuse National Science Foundation Money Intended to Fund Science Research? December 17, 2015. Note: late at night Seattle time, Thursday, December 17, the Discovery Institute's first comment on this paper was published by John West, Vice-President of the Discovery Institute. Instead of reviewing my paper in any detail, or attempting to understand the methods and the inference questions involved, West chose to try to "get me in trouble" with funding agencies by suggesting improper conduct. This is ridiculous on its face — this is a work of phylogenetics, all of my research is connected to phylogenetic methods, and the grants I have been supported by (I am not a PI on any of time) had me on them for work in phylogenetic methods, specifically Bayesian methods, and with one of the goals being the incorporation of fossils. I posted a longer response at The Panda's Thumb, above. I do think this is indicative of the kinds of anti-science shenanigans that antievolutionists and global warming deniers regularly attempt to pull on scientists, in order to try to suppress science they don't like, and to harass scientists they don't like. I strongly believe that scientists have to immediately stand up to these cheap attempts to bully scientists, which, ironically, are an actual threat to Academic Freedom, and that scientists should always be ready to explain why their work is in the public interest. Ignoring these bullying attempts only provokes more of them. Matzke, Nicholas (2015). The evolution of antievolution policies after Kitzmiller v. Dover. December 17, 2015. Phylogenetics in biology does not depend on the randomness of mutations — the only key assumptions are that changes are inherited, the characters are at least somewhat independent, and that the rate of change isn't so fast (compared to the rate of copying) that the signal of ancestry is totally obscured. In morphological phylogenetics, probably many of the character changes are due to natural selection favoring certain variants, instead of random mutations that are then randomly fixed via genetic drift. This bill would also expressly provide that a public school student or student at an institution of higher education may not be penalized for subscribing to a particular position on origins if the student demonstrates acceptable understanding of course materials. In addition, students are not expressly provided a right to a position on biological or physical origins. In addition, students are not expressly provided a right to a position on scientific views. In addition, students are not expressly provided a right to positions on views. My question: What does "positions on views" even mean? Any views? Views on bubble-gum? What? The District also understands that the teaching of some scientific subjects, such as biological evolution, the chemical origins of life, global warming, and human cloning, can cause controversy, and that some teachers may be unsure of the District's expectations concerning how they should present information on such subjects. 1.The board of directors of each school district shall authorize and assist teachers, principals, and other school administrators to create and foster an environment within the school district's elementary and secondary schools that promotes critical thinking skills, logical analysis, and open and objective discussion of scientific theories. If a teacher provides instruction relating to evolution, the origins of life, global warming, or human cloning, the teacher shall include opposing points of view or beliefs relating to the instruction. My question about the 2015 bill: What are the "conclusions and theories" on human cloning? Basically, everyone agrees: No one has cloned a human, and no one should. It's not even a moral "controversy" on its own terms. And, the few claims about human cloning having been performed (from e.g. Raelians) are not credible, so that's not a controversy, either. And, even if there was a meaningful "controversy" over human cloning, it's still not appropriate to drag evolution and global warming into that alleged "controversy". One could argue that these are social-political controversies, but the legislative bills portray these topics as scientifically controversial, which is inaccurate, and misleads introductory biology students.